We have all heard the term safety net. It’s a system, a policy, a program, or device used to protect its owners just in case something bad happens. For example, people often refer to social security as a safety net for older people who don’t have a pension. The term comes to us from the circus, where large, roped nets are set up below trapeze artists. Without the nets, sweaty palms or small distractions could mean instant death. But with the net, they fall harmlessly and land with only a fright. However, most trapeze artists never want to fall. First of all, falling is a sign of failure. Second, when the term originated, the circus actors didn’t trust the integrity of the net, as circuses had and have notoriously bad maintenance. Safety nets have flaws. Trapeze artists know that. Some nets even have holes. 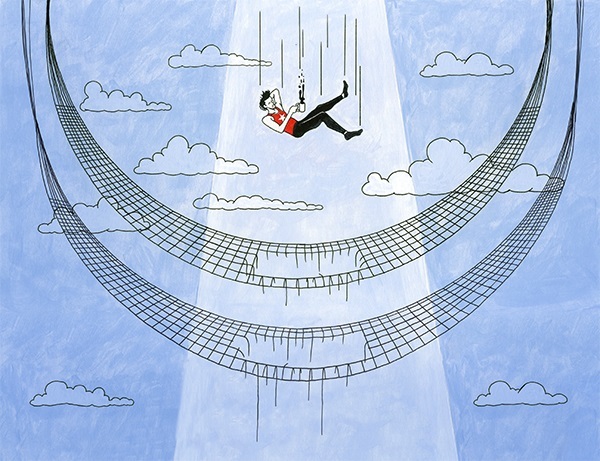 When I worked for a power company, a seasoned nuclear power plant manager told me every safety net has a hole. The nuclear power industry has procedures, training programs, meticulous documentation, and best practices in place to avoid mistakes at all costs. These are its safety nets. Yet as with circus nets, every single program or system could fail. One of the benefits of GIS for utilities is the improvement it offers in safety–for both employees and customers. But not many people agree. They’ll offer that access to reliable data is fine for other reasons, but not safety. Yet my argument is that if workers are unsure of where something is located, they might mistake one device for another and get hurt. Those who disagree with me say that utility workers would never work on a power line or gas main without first testing it, dead or empty, and then getting clearance from dispatchers. They are certainly right, to a point. No one would be crazy enough to rely solely on outdated or sketchy records in the face of life-threatening decisions, right? I’ll give you an example of something that happened several years ago. A line worker was disconnecting a faulted cable from a switch cabinet. The worker was near the intersection of two busy streets. He had a GIS printout map. The map clearly showed the location of the switch cabinet, along with its ID number. The worker had learned from a dispatcher that the cable had been de-energized. The worker found the switch and opened the cabinet door. Then he cut into the cable. The flash knocked the worker several feet. It burned his face and hands. The cable faulted, which caused a substantial outage. Luckily, the worker survived. The company recorded a lost-time injury. OSHA told the company to explain what happened and why. An expensive and time-consuming audit followed. The worker was out of work for many days. First, the map was right. But it was old. Months earlier, an engineer had issued a work order to move the switch to a different location. No one ever updated the map. So the map had taken the worker to the wrong switch. The difference between an updated map and an old one hinged on a pile of work orders, including the completed switch relocation, waiting for someone to update the GIS and print out a new map. Do we blame the GIS for the accident? Do we blame the worker or the dispatcher? Do we blame the worker’s supervisor for not having a fully trained staff? Who or what is to blame? The answers lay in a gray area. A lot of safety nets failed. The first safety net was the rule to test each cable, dead or alive. The worker had ignored this rule—the first hole. The second safety net was protective gear. The worker wasn’t wearing any. Why put on hot and uncomfortable gear, when he knew the cable was dead? The third safety net was the dispatcher declaring the cable de-energized, based on an incorrect record of the location of the switch. If the GIS had been updated and everything else had remained wrong, nothing bad would have happened. Of course, this rule-violating worker was an accident waiting to happen. Today, GIS isn’t about printing hard-copy maps and mailing them to field workers. It’s about interactive maps that communicate real-time information. Esri’s GIS is a location platform, where the essential elements are the ability to quickly share, communicate, and collaborate critical information throughout the enterprise. It’s in the ability to quickly communicate to everyone from the board room to the dashboard the state of the system that helps close those holes in the safety net. The platform reduces the (deadly) backlog of core-data updates. It shortens time between when a change in the system occurs and when the GIS gets updated. Mobile GIS facilitates such sharing and collaboration of data more than ever. In my example, even if the utility had corrected its GIS data, there is no guarantee that the dispatcher would have had access to the current data. Even today, many dispatchers operate from paper maps or printouts of GIS maps. Utilities can upgrade systems to assure that all parties operate from the same information base—whether on a GIS desktop, the web, or a mobile device such as a phone or tablet computer. GIS in the cloud, distributed to all parties, can help. Every safety net has a hole. We can’t completely eliminate these. But like the trapeze artist, we understand that holes do exist, and we must be ever diligent. ArcGIS for Utilities provides the elements of this location platform. Learn more about increasing your safety through GIS at http://www.esri.com/software/arcgis/arcgis-for-electric.